Scientist and professor. Died in attempt to prove this mountain highest in eastern U.S. Grave is at the summit, 285 yds. 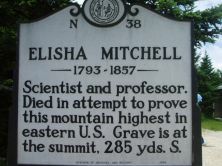 S.
On June 27, 1857, Elisha Mitchell, exploring the Black Mountain range, slipped and fell to his death in a deep pool at the bottom of a sixty-foot waterfall. Search parties were organized (by Zebulon Baird Vance, future governor and United States senator for North Carolina, among others), and the body was discovered several days later by “Big Tom” Wilson, noted bear hunter and woodsman. Mitchell’s death “cast a shadow of profound grief over the entire state.” Initially interred in the cemetery of the First Presbyterian Church in Asheville, his remains were moved in 1858 to the top of the mountain on which he died. At the reburial University of North Carolina President David L. Swain announced intentions on the part of himself and N. W. Woodfin as owners to present the tract at the top of the peak to the University trustees on the condition that it be called Mount Mitchell. 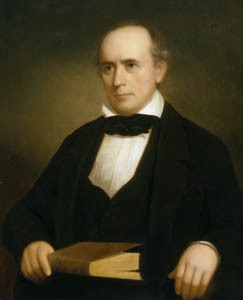 Mitchell was born August 19, 1793, in Washington, Connecticut. After a stint at Yale, he came to the University of North Carolina from his birth state in 1818 to teach mathematics and natural philosophy, a field that would in time include botany, zoology, and some physical sciences. By 1825 he also had taken responsibility for teaching chemistry and geology. In the Raleigh Register of November 3, 1835, Mitchell announced that a peak in the Black Mountains was the highest in the eastern United States, news that aroused considerable interest. He estimated its height at 6,672 feet, only twelve feet short of the present official height of 6,684 feet. A “controversy of major proportions” ensued in the 1850s between Mitchell and U.S. Rep. (and later Sen.) Thomas L. Clingman, who called into question the accuracy of the earlier observations and measurements. Mitchell died at age sixty-three in an effort to set the record straight. In 1888 a twelve-foot bronze obelisk was erected at Mitchell’s grave. It was destroyed, apparently by wind, in 1915. The stone sarchophagus, iron fence, and bronze plaque at the site were erected in 1926. 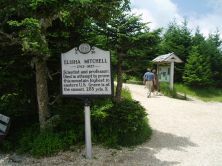 Mount Mitchell became North Carolina’s first state park in 1915. The observation tower at the summit is adjacent to the gravesite.